I’ve often been given a compressed file with the “.rar” extension. This format is not supported by MacOS by default. So I use the software UnrarX to extract files with this extension. UnrarX is freely downloadable software. A commonly used application for compression on the Mac is Stuffit Expander. However, I’ve noticed that UnrarX seems to work better than Stuffit Expander when extracting a very large file. Let’s check it out. Begin by downloading the application installer from the UnrarX website. The current version is v2.2. After the download completes it should mount automatically. If not, double click on the downloaded file to extract it. 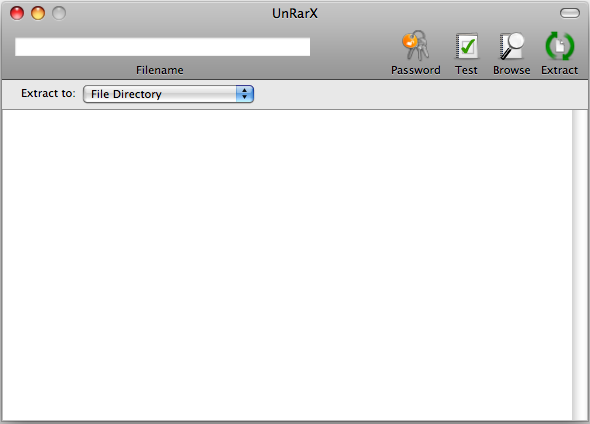 Drag and drop the UnrarX application file into the Applications folder on your Mac. Double click on UnrarX in the Applications folder to launch it. As you can see in the image above, UnrarX has a simple, clean user interface. This is good because I never find myself using most of the fancy options. I just right click on a RAR file and ask it to be opened by UnrarX. UnrarX on its part takes care of extracting the file without any fuss. You can also drag and drop a RAR file into the UnrarX window to have it extracted. UnrarX also supports passwords. If the RAR file you are trying to extract is password protected UnrarX will prompt you to enter the password. UnrarX also comes handy when you have a RAR file that has been split into multiple RAR files of a smaller size. Open the last file using UnrarX and it will automatically extract all the files in the right order. I find this particular feature very useful. All in all UnrarX is a neat little application that makes life easy without any fuss. It can handle large files, multi-part RAR files, passwords, and so on. And it’s free.